Now available from Orkney Heritage Society's online bookshop. 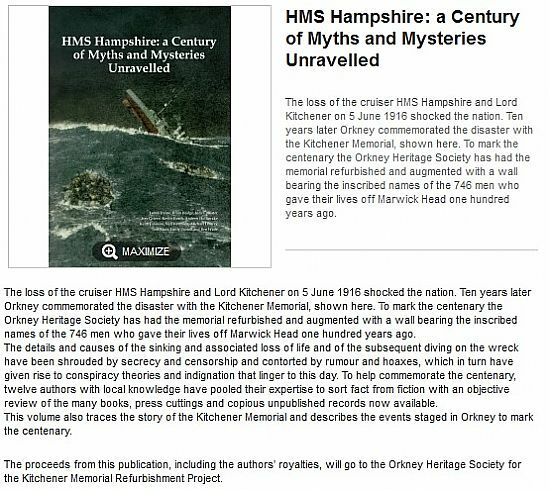 The book assembles hitherto unused contemporary evidence to explore the causes and circumstances of the loss of HMS Hampshire on 5 June 1916 and to the associated myths and mysteries. notes on the survivors and many of the men who lost their lives. A4 120-page illustrated case-bound book. £25, plus postage & packing. All proceeds, including authors’ royalties, will go to the Orkney Heritage Society for the Kitchener Memorial Refurbishment Project.